Got mine today! Set it upon the spare room. I think for me this is shelter perfection. Just enough extra length. Still plenty of room for gear and maneuvering inside. Love the brown color. More brown than the olive brown from a couple of years ago. Very stealthy. Awesome. I'll get some pictures posted with pad, person and gear inside. great to hear Ken! I placed my order on Monday…would love to see more pics! 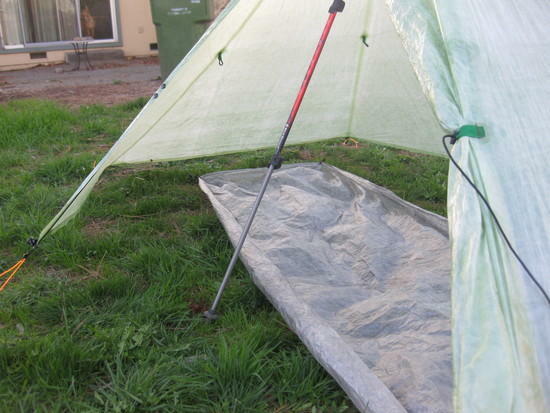 Question for you, as I have been considering getting a regular solomid (I am 5'6"), what are you using for a ground sheet? Polycro sheet or a bivy of some sort? The Solomid appeals to me for situations where there is prolonged rain be it for one day or multiple days. Seems great to be able to have 360 coverage and to sit up vs. being "trapped" under a low hanging tarp on my back or belly for endless hours. Hi Tony, I will use either a bivy or an Adventure Medical Sol Survival Blanket. Just need some time off that coincides with bad weather now. 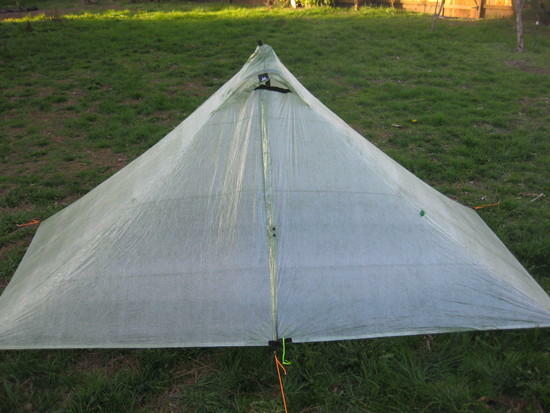 Here are a few pictures of my Cuben solomid XL. I have had it for a couple of weeks now and today I had a chance to set it up and play around with it a little. I set it up with my Zpacks solo groundsheet and BD Trail ergo poles (no extenders needed). 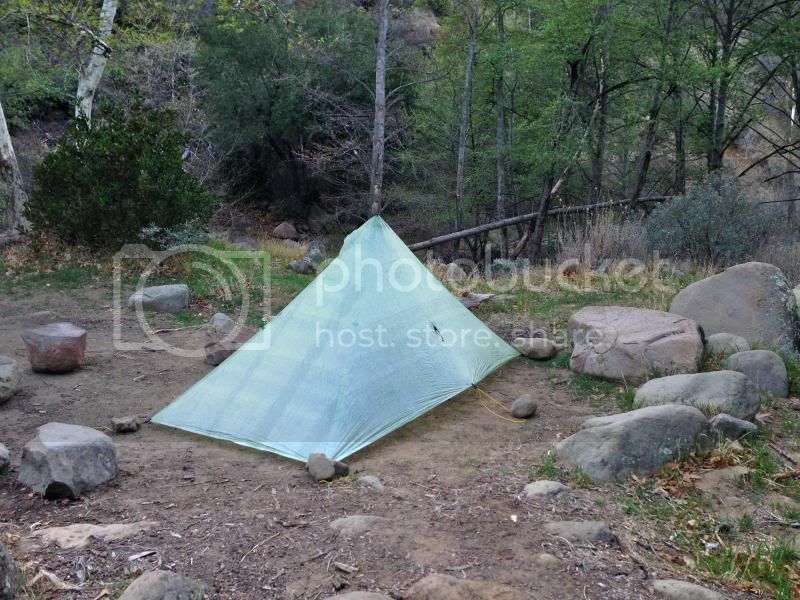 I plan to use this shelter with a combo of the zpacks groundsheet and the s2s nano net. I am really impressed with the size. Being 6'4, I have plenty of room compared to my regular solomid. 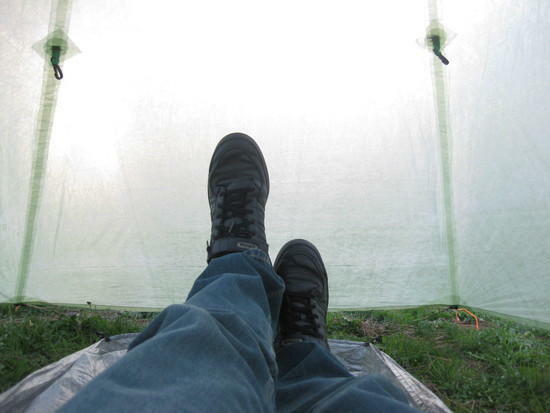 I can sit up with plenty of head room, although I still touch my head on the tarp on my way to sitting fully upright. It is large enough to fit my gear and accommodate my size but I think it is still small enough to fit in though tight camps. 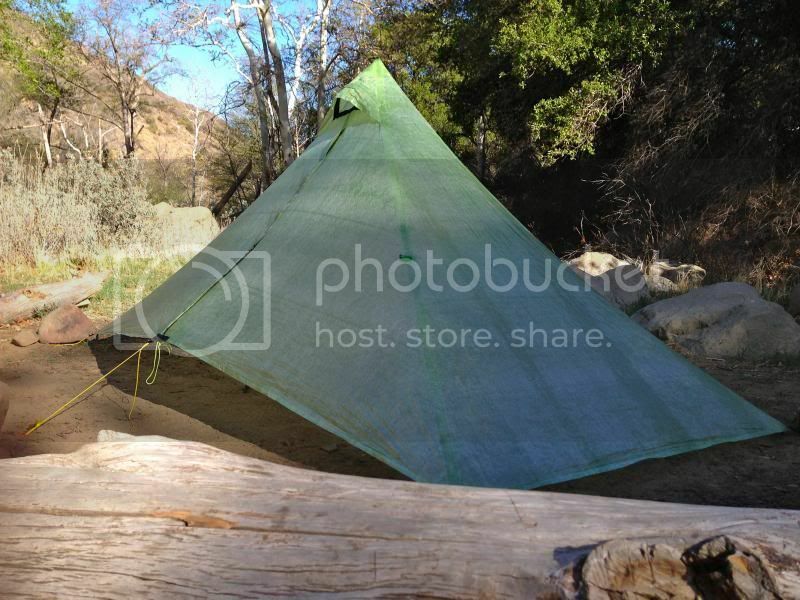 I think MLD nailed it with this shelter! I plan to use this extensively this spring/summer and it will be my shelter on the JMT in July. Here is an idea of height above my feet. For reference, I wear a size 13. Arn, what lengths are your poles set at? I had my poles maxed out at 140+ cm. I was also able to set it up with a single pole offset between 135-140 cm. I did a mock-up of the different sizes of the MLD 'mid shelters from the side to get a height/width comparison. From there, a little basic math got me the projected pole lengths with the inverted-V in a tight-to-the-ground pitch. 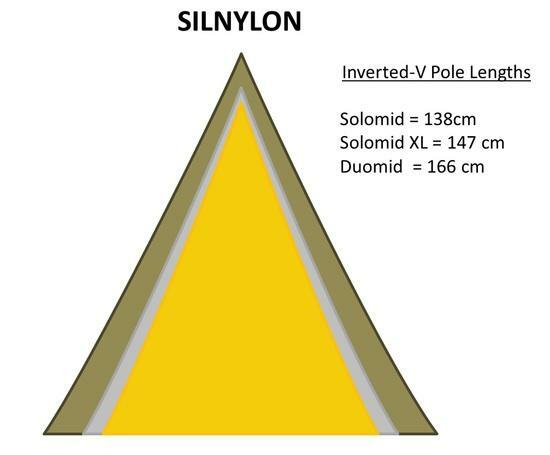 I love my sil Duomid, but I'm growing weary of the center pole in the middle. So the Solomid XL is attractive to me simply by being in between the two sizes, and the extra length should give me a hair more space with the NeoAir. My silnylon Duomid is usually around 59-60" with a tight ground pitch, so I tried to account for that in the different versions. "The current SilNylon and Cuben mids are all cut on the same pattern and so should be very very close in size. 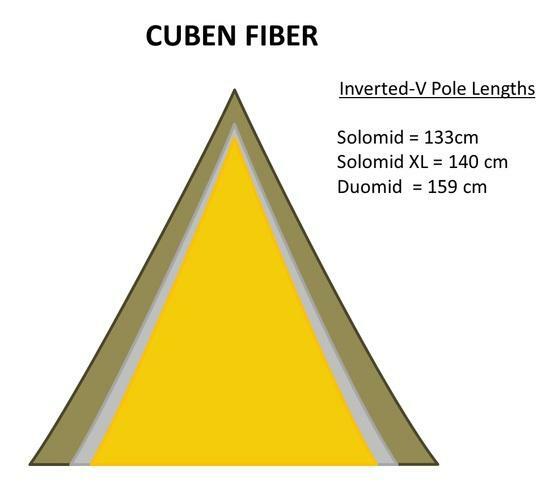 While the Sil version can stretch a little bit, the cuben versions are not rolled main seams- they are bonded- and so really a hair larger and do not stretch." I'll find out more when mine arrives. Sorry, didn't mean to post and run, but my membership expired right after my last post and it took a while to get the 'F' membership grandfathered in. Anyway, I took it with me on the recent "Feb 2014 – Yosemite in the Rain" trip posted in the trip reports forum. I found there was plenty of headroom and I was able to sit up on my pad without hitting the fabric. But as Arn mentioned, my head would still touch the fabric on my way to sitting fully upright unless I actively tried to avoid this. I also used the inverted V setup, so can't comment on the single pole related questions. I did find that I still preferred to sleep diagonally to maximize the space and because of this I'm not sure if I'm going to end up keeping this or my Duomid. Since the Duomid is wider, the diagonal is slightly longer. Plus it's a little bit taller, which helps. Of course it's also slightly heavier. I'll have to compare them side by side at some point before deciding which to keep. On a related note, does anyone know if the dimensions of the Duomid recently changed? I was pretty sure that when I ordered the Solomid XL it was 6" longer than the Duomid, but when I just checked the specs on the website it's only 3" (9' vs. 8' 9"). Oh great. Another shelter I want. Ken Thompson brought his SoloMid XL over to my place yesterday so I could see what it looked like. I posted some photos on facebook and thought some of you might like to see them! We had fun playing around with a few different configurations. At one point both of us got inside and had enough room for us and our gear and could have easily been out of the rain if it had been raining. One of the great things about a shelter that does not have to be exactly setup in one specific form 100% of the time!! Both of us were highly impressed with this shelter – and the fact that it is only $210 bucks just makes it all the much sweeter! I'm in the market for a new tent and this looks perfect. What size trekking pole is needed for a setup like this? I have the fizan compact 4, which I love, but it only extends to ~125 cm. You can see in a few post above that you need a minimum of 140 cm poles. I was able to achieve the inverted V setup and offset single pole with my poles maxed out slightly above 140 cm. Are there any type of pole extenders I can get or anything so I do not need to replace my poles? "Works perfect with most all 140cm adjustable poles. Fixed length pole users can ask for two free 6" pole jacks if needed. A fully extended 140cm pole is about 54" ." "Q: What poles fit the SoloMid XL? A: One regular length 135cm or longer adjustable trek pole will work well just like with the SoloMid. A single pole can be slightly offset to the front leaving enough room behind the pole for a full sleep pad. An inverted V double pole set up is not needed. That would need two 6 pole jacks and 140cm+ lenght poles and may stress the pole tips. Users with shorter adjustable or fixed length trek poles can ask for a free 6" pole jack. Our Komperdell UL Carbon 145cm poles can be bought as a single and work great!" Alternatively, you can buy lighter ones from places like Ruta Locura. For bugs, this shelter is useless mid-season unless I keep it zipped up all the time. I feel like this defeats the purpose of tarping/trying to get closer to nature. 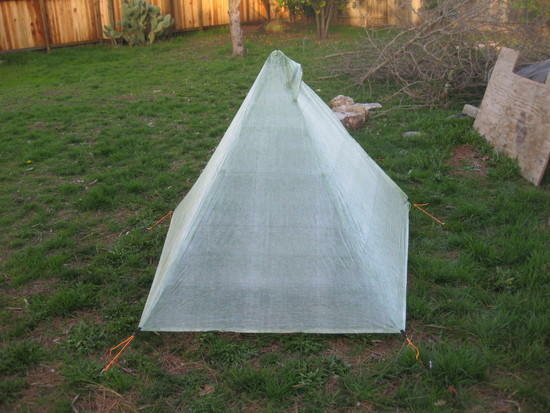 I don't sleep well with a bug net on my head, and I also feel that buying the bug net is a waste… the weight of silnylon solomid XL plus the MLD innernet bug tent would be about the same as a BA flycreek UL2 – 18.5 oz for the tarp, 9 oz for the inner net, or a total of 22 oz for just the tarp with bug netting on the bottom and in the vent… That means that for the first option, I'm at 27.5 oz, whereas I'm at about 32 for my flycreek with my ti stakes and minimal rigging setup. I think you answered your own qUestion, it's the switch worth it just to save a few ounces? It is about the difference of a gulp of water. I have a smd net tent that weighs 7.95 ounces, and it's better than mlds version because it has 6 inch vertical wall pullouts. The switch would be slightly better i think. It will be more versatile for sure. For one it's side entry, and a little more space. You can hang out in it with one or two doors open and get shade etc. 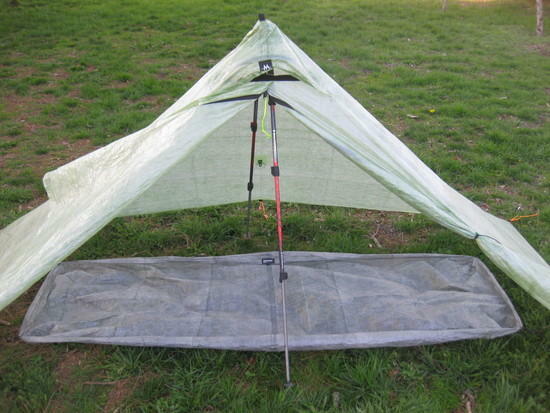 I would do it, the pole will be less bulky, packing will be better with the tarp, net, pole in seperate sacks. Depending on the pressure, one of the advantages of a mid is that bugs tend to fly up to the top. With the MLD open vent (i.e., no mesh) they can in theory escape from there. So bugs are less of a problem. Since it's a little taller, the Duomid would work better in this regard. However, in heavy bug season, it's not really viable. They're just too many. If you're worried about splash from the rain, then you might think about a Duomid too. I have 155 cm poles that I can offset enough that I have nearly as much space between the pole and the wall as if with the Solomid XL. If you have long poles or a pole extension, you would have a bit more space. Either way, you're really trading versatility and shelter strength over your current set up. Ounces are secondary in my opinion. Anyone use one in the field yet? Ken T took one on a hike a few weeks back when we did a short overnighter. I only got a few photos of it. We setup camp early to wait around the rain and it ended up rained on us for 11+ hours (4pm through a bit after 3am). The brown does look nice. The Green Cf looks.very nice. I could not be happier. Big enough, long enough. Color I like. Stupid simple to pitch. My sil version weighs in at 19.3 oz after seam sealing and adding guy lines, in the stuff sack. Just whipped up a clip in silnylon bathtub floor for another 5.5 oz with stuff I had laying around. A happy camper. Thanks again Ron Bell. Thanks for the weights, after your post I am on fence as there is only a 4oz weight saving over my Golite Sl3.